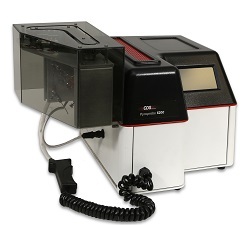 Increase the throughput of your pyrolysis laboratory by using the autosampler module that can added to the CDS-6000 and CDS-6150 pyroprobes. The system provides hands-free analysis of up to 47 samples enhancing operational capacity by allowing unattended operation. Solid, viscous liquid and powder samples are analysed directly, eliminating the need to perform lengthy sample extractions or derivatisations. The autosampler module is an add-on option to the DISC and can be installed onto both the 6150 and 6200 pyroprobes where the sample is gravity fed seamlessly into the DISC chamber. Our applications are updated regularly, please click here for listings.